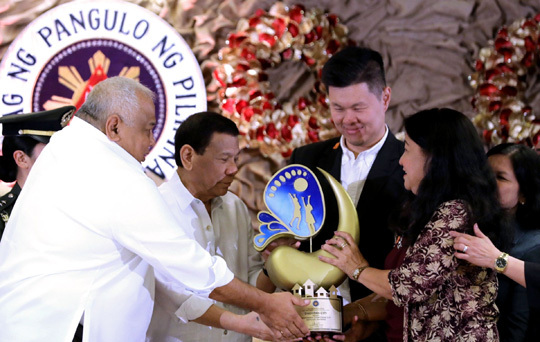 President Rodrigo Duterte confers the 2017 Presidential Award for Child-Friendly Municipalities and Cities, Independent Component City Category trophy on the local government units of Dagupan City, during the awarding ceremony at the Malacañan Palace on Dec. 5, 2018. Receiving the award is Dagupan City Liga ng mga Barangay president Dean Kua. Assisting the President is Executive Secretary Salvador Medialdea.